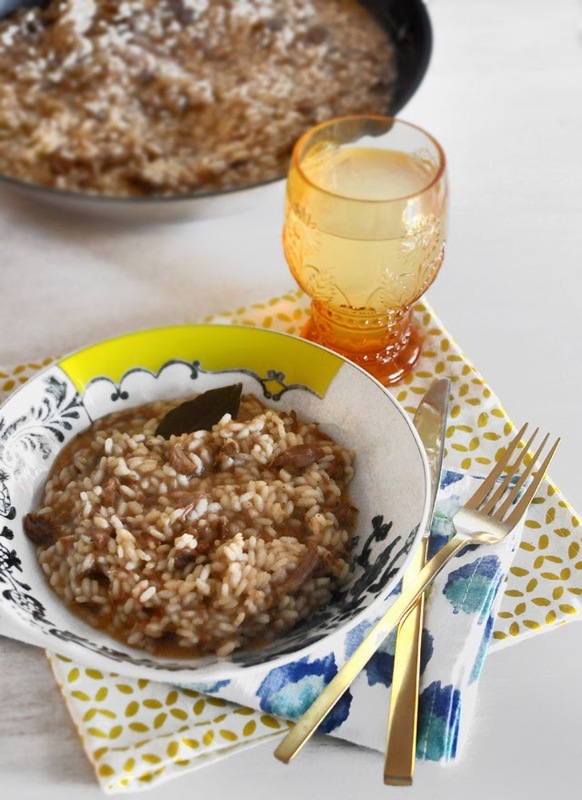 To go back to this delicious dish, it takes a while to make the perfect ragout and after you have that, risotto comes together really fast in under half an hour. This is going to become your favorite, you'll see. And if you are not a rice person, try throwing some homemade gnocchi on the ragout. Just WOW! Cut the meet into 1 inch pieces and slice the onions into very thin strips. Heat up some canola oil in a pot (I like using my dutch oven pot) and add the onions. Cook until transparent and then add the meat. The meat will release its juices and you need to keep cooking them like this, stirring occasionally until all the juices evaporate and you are left with more or less oil on the bottom. Then you add the spices and salt and pepper, stir again and add the tomato paste, bouillon and water just to cover the meat. You will need to keep and eye on it and occasionally stir it and add water as it needs to cook for a minimum of two hours. Some pieces of meat will fall apart on their own, some will remain small chunks and here I shred it a tiny bit with two forks if I'm using the ragout for the risotto. If I'm making gnocchi with it I leave it as it is. Just make sure you keep adding enough water so you end up with something resembling a thick stew. In a deep pan heat up the beef ragout then add rice to it. In a separate part heat up the beef stock. 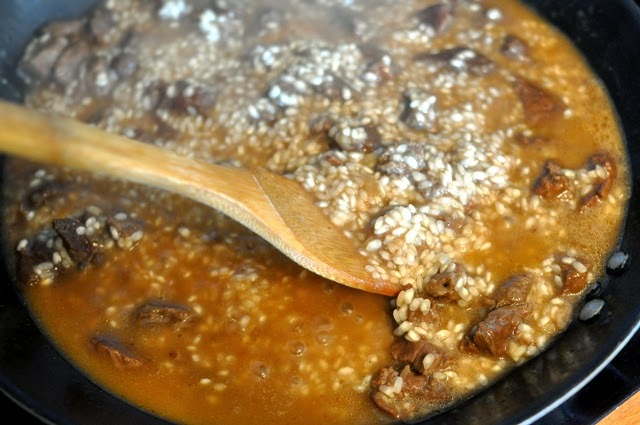 Little by little keep adding the beef stock to the rice, as needed and stir often. You will need to stir constantly towards the last few minutes. Cook for about 20 minutes or until the rice is done al dente. Take of the stove and add the butter, then gently stir it in the risotto. 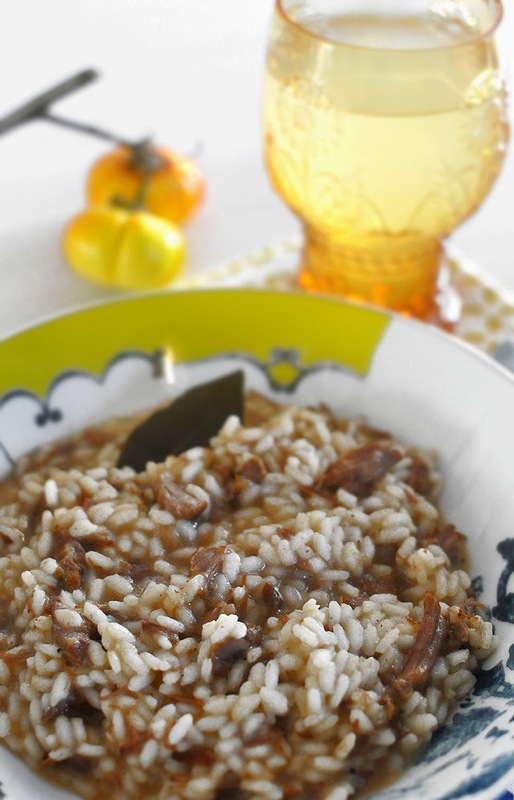 This should only take a few seconds and then let the risotto sit for three to five minutes before serving. Serve with freshly grate Parmigiano Reggiano on top. Enjoy!